Web of Science: How many arctic foxes are in Iceland? Before the regular monitoring began in 1979, annual harvest of legally hunted foxes was thoroughly registered. Thus, data from breeding and non-breeding individuals, as well as pups from den culling, exist. 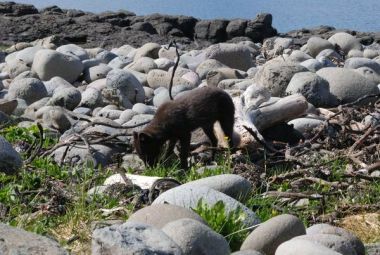 According to the hunting data, the arctic fox pupulation declined from 1958 and and was estimated around 1.300 individuals in 1979 when the population was determined by age-cohort methods for the first time by Dr. Pall Hersteinsson (1951-2011). The population today probably exceeds 10.000 individuals in autumn. Since then the population has been increasing, first slowly but more recently at a faster pace. The population today probably exceeds 10.000 individuals in autumn (Hersteinsson, 2010). Whether factors such as fertility, proportion of female breeding or winter mortality will cause a halt in population growth is unclear. Hersteinsson P. (2010): Íslenska tófan [e. The Icelandic arctic fox]. In: Palsson B. (ed): Hunting report book. The Environmental agency of Iceland, Akureyri. 50 pp [in Icelandic]. Melrakkasetur Íslands. Published with permission from the rightful owner. Ester Rut Unnsteinsdóttir. „How many arctic foxes are in Iceland?“. The Icelandic Web of Science 25.6.2012. http://why.is/svar.php?id=62652. (Skoðað 21.4.2019). What is Iceland's smallest animal? How many whales are there in the seas around Iceland? Why did the great auk become extinct? What was the great auk population in Iceland?